Just Carol: Another Little Pillow! Like the little pillow in my previous post this one was also stitched last year, and again I have only now got around to finishing it. I was so excited to win Forget Me Not Sampler by Mary Garry’s Sewing Cabin on Ebay at the beginning of last year, and wanted to start it straight away, but with these MG designs being hard to find I didn't want to risk having it sent to me in Dubai and it going missing in the mail! I didn't want to have to wait until my next visit home to pick it up to bring back with me either, so had it sent to my Mum instead and asked her to scan and email me a working copy. The fabric I have used is 48ct Raw Gander Linen, stitched over two with the listed DMC threads. I was due an eye test at the time, and knew I was needing a new prescription, so this was a bit struggle for me to stitch on the 48ct, and I will definitely be thinking twice in future before personalising over one on 48ct! The darker fabric for finishing is from Blackbird Designs Blueberry Crumb Cake. The leaflet also comes with a little pincushion design, which I will have to stitch one day too. WOW 48 count! It is beautiful Carol. I do wish Mary Garry hadn't stopped designing! It's lovely and the fabric you chose is perfect. Don't think I could ever stitch on 48 ct.
Hi Carol, I did some embroidery too, also on 48ct gander but I need magnifying-glass! I love how your cushion turned out. I love this and MG charts are some of my very favorite! Great finishing ideas on your blog. How sweet is this darling little pillow!? pretty darling and sweet!! A lovely finish and colours. I do admire the stitcheries you do and the finishes.Shirley N.Z. You chose such lovely fabrics for your finish. It looks wonderful. Lovely finish! The fabrics suit the stitching perfectly. Wonderful stitching and finishing. The fabrics are beautiful. How talented lady you are! I love everything you make, and this is so beautiful and elegant! design is so lovely but your finishing is just perfect match! 48ct..wow...that really is eye boggling stuff. A delightful finish, such pretty fabrics you chose to use in making it up too. Wow! It is just beautiful! One day I will try to stitch something on a count higher than 40 just to see if I can do it. 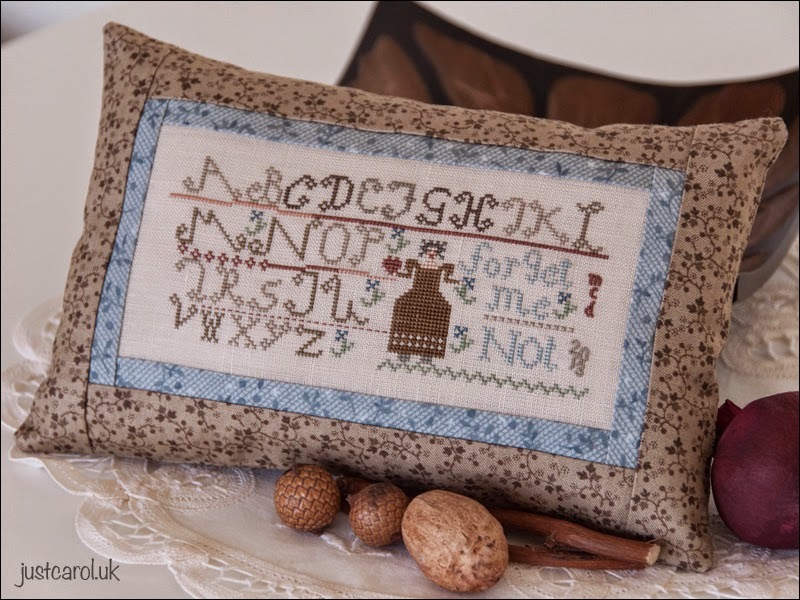 It is always so lovely to see your posts - your stitching and finishing are both gorgeous and inspiring. Hi Carol-Greetings from sunny Tracy California USA! I ran across your blog this morning and am so impressed with your stitching. It is absolutely lovely! I wish I could still stitch on higher than 40 count but alas my eyes say no more. May I ask...do you cross each stitch individually for every project or just over dyed thread? I am so particular about this and your stitches are so even. I just love it !! !